We all need to be able to whizz up a good old-fashioned chicken soup. The best ones are made with the leftovers of a baked chicken - home made or store bought. If you have turkey leftovers, use this recipe for turkey soup (Peter). You want to have some carbs in the soup. I like to add around 1 cup of this rice medley from Trader Joe's - but you can use plain rice or even potatoes or pasta. Save the bones from baked chicken for stock! Cut off any excess meat and set aside for later. ...or use these guys (I add some anyway for extra saltiness). 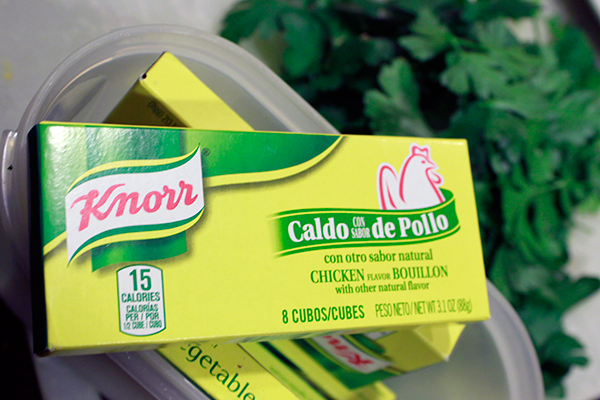 Four large chicken bullion cubes dissolved in water. Shop-bought (Trader Joe's) chicken stock (2 cartons). 1. Place your chicken carcass (as well as the giblets and the neck that you saved) in a pot of water on the stove. If you plan to make the soup right away, trim off any skin and excess fat. Add the leafy tops of celery if you have them and maybe an onion and some peppercorns. 2. Boil chicken gently for 90 minutes or so then strain. Strip off any remaining meat and set aside for the soup. If you have boiled the skin and fat let cool then place in the fridge. Once cold, skim off the fat. 1. Cut onions small and add to 2 or 3 tablespoons of oil in your soup pot and heat until transparent. 2. Tip in soup stock. 3. Uncooked rice will take 20 minutes or so to cook so add that to the stock now (if using leftover rice add this at the end). 4. Once the rice comes to the boil and after about 10 minute of cooking time add the carrots. 5. Wait another five minutes or so then add the chopped celery. 6. Wait another couple of minutes then add in your leftover chicken, chopped. 7. Add two chicken bouillon stock cubes, 2 or 3 teaspoons of salt, 2 or 3 teaspoons of crushed pepper - then test for savor. (There has to be plenty of salt in a chicken soup.) Add more salt or pepper and consider adding the juice of 1 lemon. 8. Chop up the parsley and toss that in and stir. Soup's up! 9. Serve with dill and garlic bread.